Has a squirrel ever emptied your feeder and then destroyed it because the food ran out? He won't empty a Father Nature feeder, and he certainly can't hurt it. Features such as the overhang top, the size, shape and spacing of the food ports make it hard for squirrels to reach the seed. The perches also deter squirrels because they aren't able to hang easily to get to the seed. 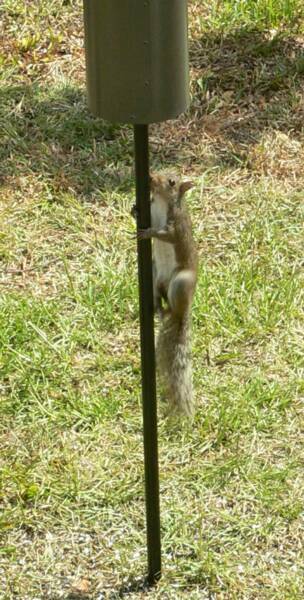 With the available squirrel baffle, they can't reach the feeder at all. Years of testing and refinement went into the squirrel baffle design. The length, diameter, and height from the ground have been tested as well as how the seed saver effects the squirrels ability to access the feeder. We understand the frustration of bird enthusiast who have sought unsuccessfully to keep squirrels from their feeders. If the feeder is placed at least 8 feet from overhanging trees or buildings, squirrels cannot jump to the feeder from above and they can't climb to the feeder from the ground. 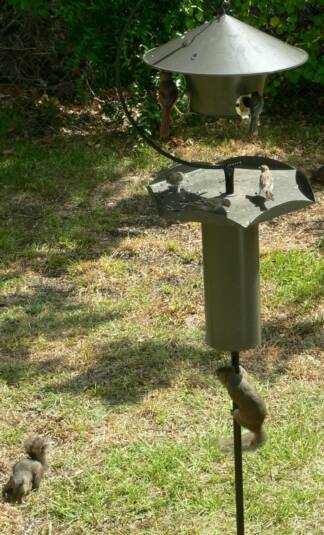 Father Nature squirrel baffle will protect feeder from even the most determined squirrels.